There have been new challenges where Bugaboo is concerned over the last few months. It's hard to explain. One would have to be in our house for a day or two to really get a better picture of it. A big portion is unexplained crying/meltdowns. This has finally decreased in the last month after we took a recommendation from our pediatrician after researching and weighing the pros and cons. It hasn't been a miracle solution by any means, but it has definitely helped. His words and phrases are increasing, which is a good thing, but communication is still a struggle. He can answer uncomplicated/familiar questions, but he cannot carry on a conversation with you or tell you a story like a "typical" three year old. He has lots of lists, he will sing songs (not with you and most of the time not to you - but on his own terms), and his favorite things right now are books. Each morning he wakes up, he sits on his bed and gets books from a pile beside his bed or from his bookshelf. He "reads" through them, flipping pages, saying what he sees, sometimes saying a phrase from the book. We have also found that giving him time with his books when he is in meltdown mode is helpful and calming. His favorite book right now is Oh No, George! We have renewed it from the library as much as possible, so I should just break down and by it. I love listening to him "read" it by himself or with Bubby and me. I have noticed Bubby trying to engage his little brother even more lately. It doesn't always work - Bug typically just wants to parallel play or to just do his own thing altogether. But every once in awhile they "play" in the little kitchen together. Bubby loves cooking shows (sadly we don't have cable, so no FoodNetwork unless we are watching at Babushka's), but we do watch Master Chef. These shows inspire Bubby to create his own "recipes" with the felt food and other play items. When we ask what Bugaboo is making, he always says, "chips and salsa," "tacos," and occasionally, "coffee." My favorite moment of today was when The Hubs was getting ready for work. I was in the middle of something, and out of the corner of my eye I see Bubby leading his little brother by the arm. "Bugaboo! We're going on an adventure! We're going to sneak up on Mom and Dad!" Bug allowed Bubby to lead him for a little bit, but not for long since he doesn't like his hands/arms to be touched. Bubby was sad that his little brother didn't want to play with him, and tried a few more times without much success. Several times today I heard him say, "Come play in here with me, Bug." or "Come do this with me!" Most of the time Bugaboo continues ignoring him, and that is hard for the big brother. I am thankful that Bubby wants to play with his little brother. Most big brothers (or sisters) don't seek that out, which may be why it is simultaneously heart-warming and heart-breaking for me during these "Let's play together" moments. But this is the life we have been given, and I really can't imagine it any other way. 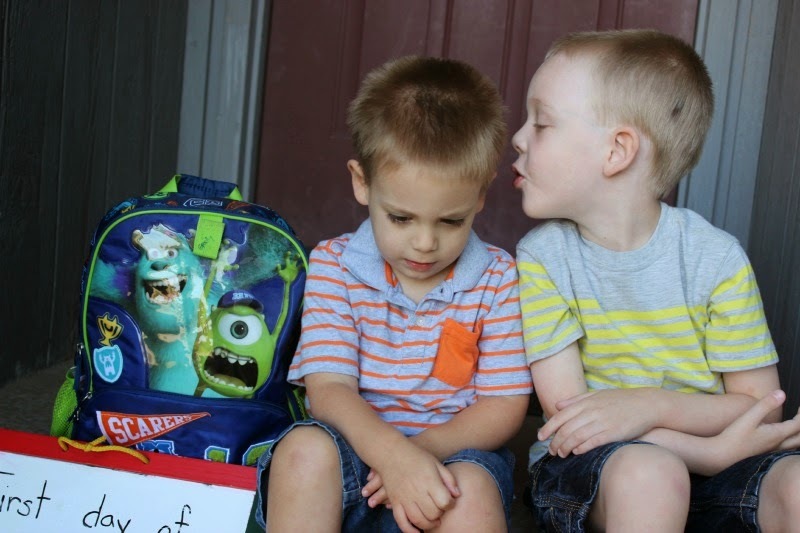 I prayed when I was pregnant with Bugaboo that the boys would be good friends. And they are. They are good friends and good brothers to each other. At the end of the day, they both sat on the couch laughing and smiling at our new DVD, Celery Night Fever, looking like very typical brothers. And in their own way, they are - atypical typical brothers. So heartwarming. I think the best families are those in which everyone accepts everyone else as (s)he is. My oldest is the one on the spectrum, and for a few years I beat myself up for not seeing what was there and having another baby when I should have just given him all of myself and maybe I could have made him all better. Now I know that was wrong, because my sons love to play together, and having a little brother who is making strides and doing new things pushes the older one to go farther and try harder. They play together in a way that I don't even understand, but my younger son is able to get the older one to talk and interact more than anyone else. It is really amazing to me, especially when I remember how I thought the situation would be better without the boys who followed the first. You are seeing that in your sons too, and I love the acceptance and the unconditional love that our special kids get from their siblings. This really warms my heart, even as you are sometimes struggling they are blessing you. Take care sweet mama!